Home Blog What Types of Drinks Do Spanish Speaking Nations Enjoy? What Is the Drinking Culture Throughout the Spanish Speaking World? Before you begin working your way to foreign language fluency, it helps to understand the culture behind the language you’re learning. After all, language exists to help a group of people express their ideas and beliefs. Spain is an old country with a rich history and culture. As you begin your Spanish language program, gaining a strong grasp on this history, the values, and the etiquette will help you rapidly achieve success. In particular, Spanish speakers tend to enjoy a variety of beverages as well as a social attitude towards drinking. 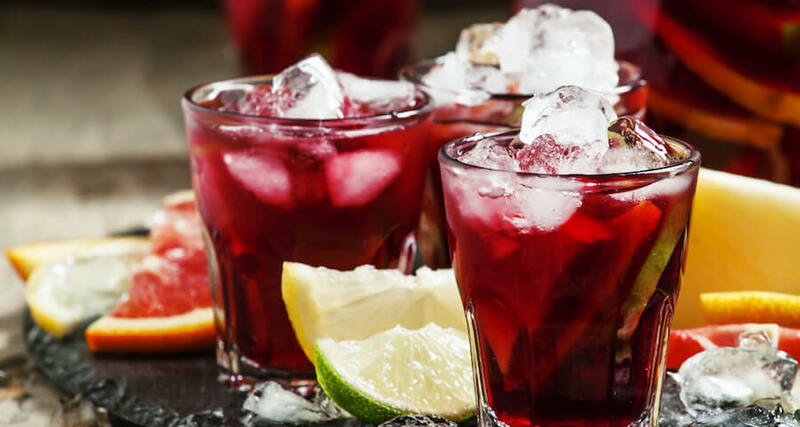 Latin America and Spain are rich with fresh produce and exotic fruit juices, however, the consumer demand for sugary soda drinks is amongst the highest in the world. And unfortunately, the combination of these sweet drinks with junk foods has led to an obesity epidemic in Latin America and Spain. In fact, a rise in diabetes has become a major concern of health officials. In response to this health crisis, the Spanish government imposed a 10% tax increase on sugar-sweetened beverages in 2014. Since the imposition, soda sales have fallen by 12% in Latin America and Spain. In some instances, beer replaces sodas. Grupo Modelo, owned by Anheuser-Busch, produces the most popular beers in Latin America like Corona, Negra Modelo, Modelo Especial, Leon, Victoria, and Pacifico. Additional popular beers include “chelada” and “pulque.” Cheladas are lime juice shandies prepared with Worcestershire sauce, clam broth, and tomato juice. The beverage is served in a chilled pint with salt and chili around the rim. Pulques are creamy viscous beers developed from juice fermented from the Agave plant. During Aztec rule, the drink was considered sacred. Up until the 1950s, the working class widely consumed this alcoholic beverage. Today, the product is less accessible but can still be found in hipster bars in Mexico City. Grapes thrive in the Mediterranean-like climate of Latin America and Spain. The Jesuit and Franciscan missionaries sowed the first grape seeds during the 1700s. Today, wine lovers visit Valle De Guadalupe and Valle de Santo to taste chardonnays, sauvignons, and nebbiolos. Popular beverages in Latin America include flavored water, fresh juices, coffee, and sodas. These beverages are enjoyed in restaurants and homes and can also be purchased from street vendors. “Aguas frescas” (“fresh waters”) is made by combining sugar, water, and fruit in a blender. In Latin America, popular flavors include tamarind, pineapple, hibiscus flower, and beetroot. A thicker version of an aguas fresca is simply a freshly squeezed juice, which eliminates the water from the recipe. Popular juice flavors include mango, guava, strawberry, coconut, pineapple, and tamarind. For something slightly creamier than a juice there are “licuados,” milkshakes made with milk, ice, sugar, and fruit. The consistency and flavor of this beverage is similar to the North American version of a smoothie. This beverage can be found in licuado shops and “fruterías” (restaurants specializing in fresh fruit). Soda is a popular beverage amongst Latin Americans, as well. While they welcome brands familiar to North America like Coca-Cola, native brands like Jarritos are just as popular. Jarritos are available in unique flavors like guava, apple, tamarind, grapefruit, lime, hibiscus, and mandarin orange. In addition to fruity beverages, coffee is widely available in Latin America and Spain. “Pot coffee” is unique to these areas. Traditionally it is prepared in a clay pot with cinnamon and sugar. For those who are non-coffee drinkers, warm teas are available. Chamomile is popular while English-style tea is less common. Other pre-Hispanic drinks are available too, like “atole,” a hot creamy cornmeal beverage. Latin America and Spain’s most recognized spirits are tequila and mescal. A major export for these areas is indeed tequila. Both spirits are derived from the agave plant. Tequila is made solely from blue agave, setting it apart from mescal, which can be derived from nearly thirty different types of agave. In addition, tequila can only be produced in the states of Guanajuato, Michoacan, Jalisco, Tamaulipas, and Nayarit. Mescal is produced in Durango, Guerrero, San Luis Potosl, Oaxaca, Guanajuato, Tamaulipas, Michoacan, and Zacatecas. In fact, most mescal is still prepared traditionally on small Oaxacan farms. Connoisseurs prefer mescal produced by family-run farms. High-quality tequilas do not contain additives like sugar. “Plata” (silver) is used as a mixer for cocktails like margaritas. “Oro” (gold) receives its name for its golden hue. “Anjeo” (aged) is known for the smoothness it develops after spending at least a year in an oak barrel. In addition, tequila is an important part of the margarita, a popular cocktail that comes in a variety of flavors and textures. For instance, margaritas can be served over ice, known as “on the rocks,” or with the ice blended in, creating a slushy texture. Tequila is traditionally drunk in shots. Before the shot, a small amount of salt is placed on the tongue and after the shot; a lime wedge is sucked on. This ritual is known the world over and cuts down on the “alcoholic” taste of the beverage. Aficionados of tequila and mescal however, prefer to sip their drink.